When Amit and I were newly married, we resolved to live like the new age couples, resolutely western in our meal preferences. So we decided to have only fancy sandwiches, subs, sausages, salami, scrambled eggs, pancakes et all for breakfast! We were quite industrious in our grocery shopping those days, going far and away to the distant markets in Delhi to organise our exotic breakfast table! Oh! What days they were!! We used to reach our office with a sense of elation and pride, having gorged on a princely English breakfast. This ritual lasted till almost our first anniversary…. However, soon enough thereafter, we figured out that the Sterling denominated bills for the English ingredients were running the coffers dry! Also, it dawned on us that, all said and done, such fanciful breakfast ideas, while truly exotic, are best reserved for the leisurely weekends. The impractical ritual gave way to more convenient alternatives – Poha, Upma, Cereals, etc. 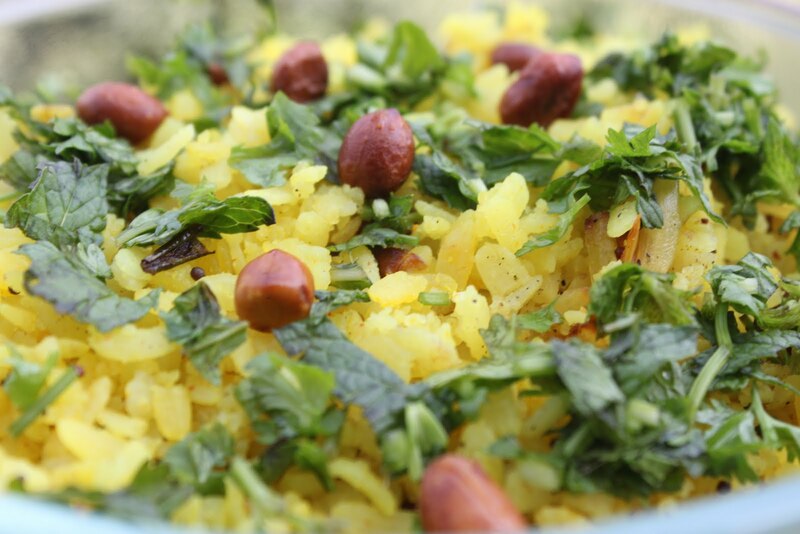 Poha is, by far, the most popular and healthy breakfast choice, enjoyed almost by everyone. Yet, making good poha can be tricky, specially because its quite easily turn out drier/wetter that desired. Hence, using the right proportion of ingredients and water is important for a yummy poha!